Hey Boos, it’s me again! I’m here to talk about one of my favorite shoes that has blessed us and made a huge impact in fashion this season. The espadrille is an extremely versatile and fashionable shoe. It can be worn many ways, in many colors, and offers the most comfort out of the choices for summer shoes. 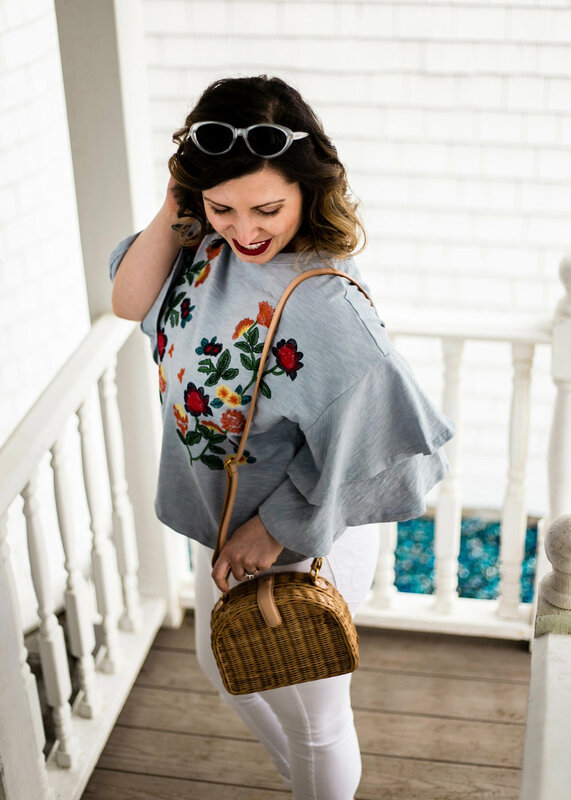 If you have not picked yourself up a pair yet you need to get on the espadrille bandwagon because they are flying off the shelves! My favorite feature of the espadrille is how versatile they are. I have yet to find an outfit that I cannot wear them with. As seen pictured above I have paired an orange lace up pair of espadrilles with an orange overall dress. I always have struggled finding a way to turn my fall/winter dresses into summer looks solely because of the choices I had for shoes. Sandals look okay with my outfits, but I prefer a closed toe shoe especially with overalls. I find the espadrille adds a unique flare to my outfit without screaming summer the way sandals do. 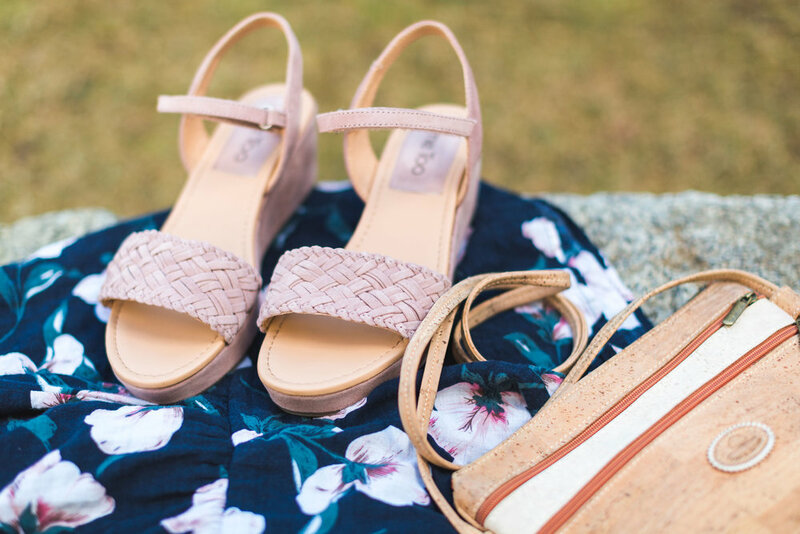 What I also love about espadrilles is the variety of colors, patterns, and styles that they come in. From closed back to open back and lace up there are espadrilles for every outfit. From there the espadrilles come in many different textures such as canvas or leather and so many fun patterns and colors that are simply amazing. What better way to spice up an outfit then a pair of espadrilles covered in flamingos or various kinds of fruits? If you can think of something better, please let me know because I cannot! Lastly, I cannot stress enough how comfortable they are! Although I have yet to invest in a nice pair of espadrilles, I can say my cheap pairs are more comfortable than any sandal or flat I’ve ever invested in. I can work an eight-hour shift in them and walk all over Boston in them with no blisters, aches, or pains! I am sure many if not all of you have invested in this trend, but if you haven’t it is certainly a trend you will not regret splurging on. They are so fun and comfortable, and I truly can’t remember what I used to do before I owned espadrilles. Thanks for reading up on my favorite trend this season, now go put on your espadrilles and enjoy the sun we’ve waited so long for! This Season's Must Have Top! Happy Friday beautiful! Congrats! We have made it through the week. Today I want to go over this season's must have top. 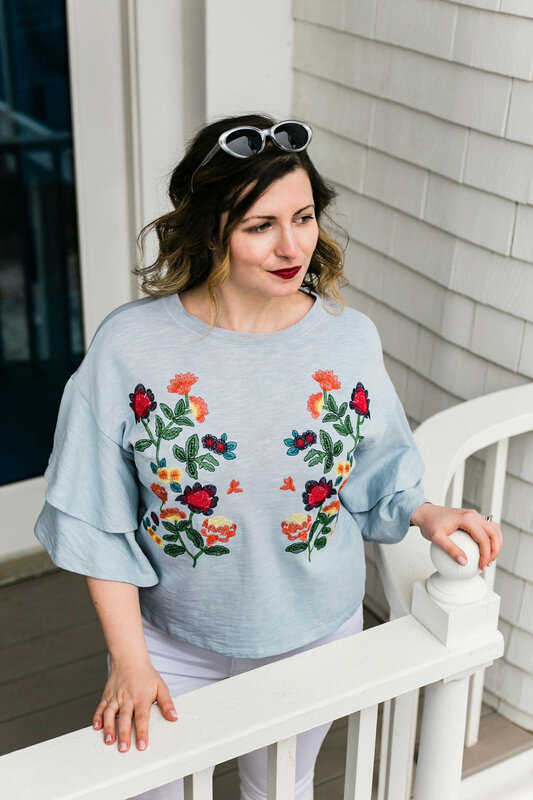 Typically I like to provide you with posts about fashion advice opposed to just talking about items but this ruffle sleeve knit top is too hot to resist. I guess in a way this is advice on getting a fabulous top in your wardrobe & how to style it. 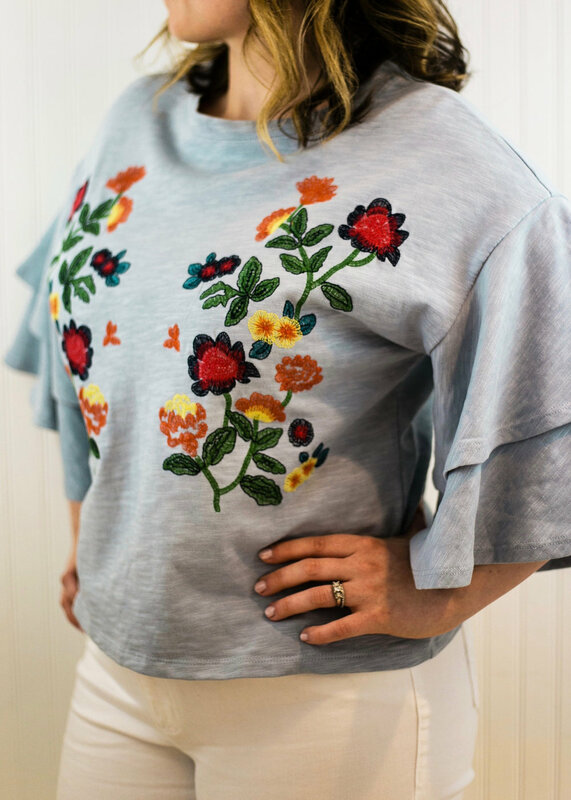 This top features fabulous ruffle sleeves & beautiful embroidery, the recipe for a show stopper. The ground color is in a light blue shade which as pictured looks great with white but would also pair back to blue denim nicely. Not only does this work with skinny jeans but it would work well with shorts! Add some sunnies, a spring bag, & wood block heels, my friend you will be ready to rock the spring season. This top can be yours for only $52 just click here! 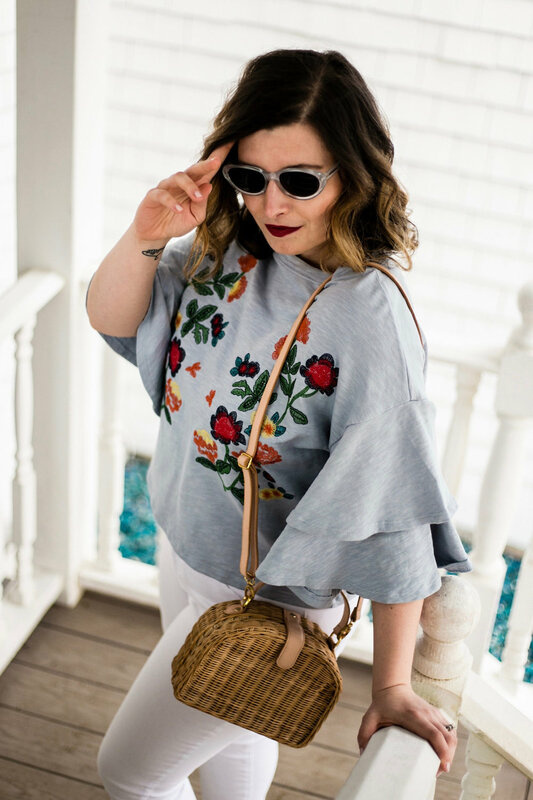 I hope this post inspires you to add a salsa sleeve top your wardrobe! 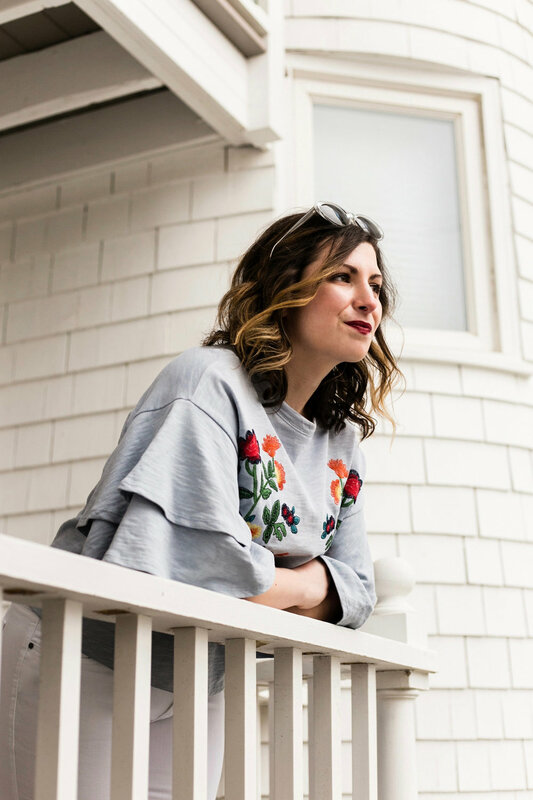 There are a variety out there that you can pick to fit your personal style. Trends are always fun but you always want to make sure you execute them to suite you because you are unique & fabulous! If you try a trend in a way that doesn't fit your personal style odds are you'll feel uncomfortable & will never be able to truly enjoy your trendy purchases. Always keep in mind to stay true to you! What's Blue & White & Striped all over? Hello, babe! I hope you had a better week than I did. I literally can't take winter anymore. It was definitely hard for me to post about such a spring look with snow on the ground. But I didn't want you to miss the opportunity to get this dress. 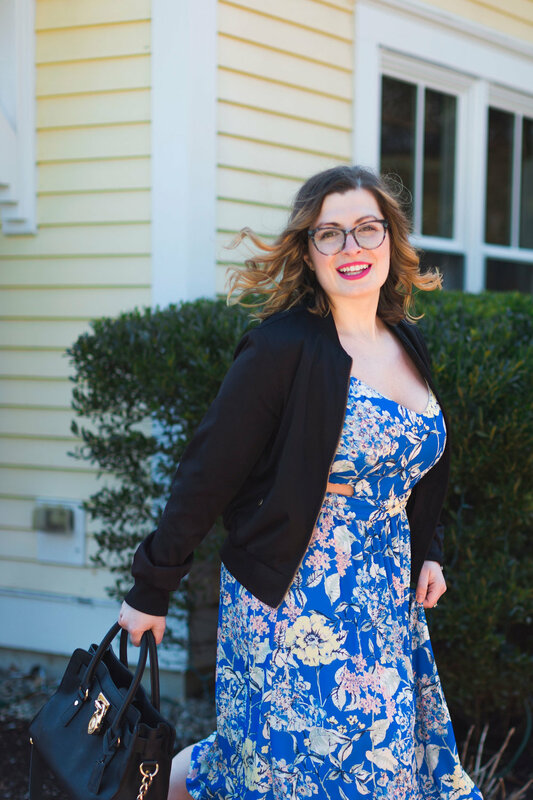 I had the pleasure of being in Femme Boutique Boston's spring photo shoot. We definitely had our work cut out for us as the waves were a roaring on Plum Island that day. Despite the odds we made magic happen. 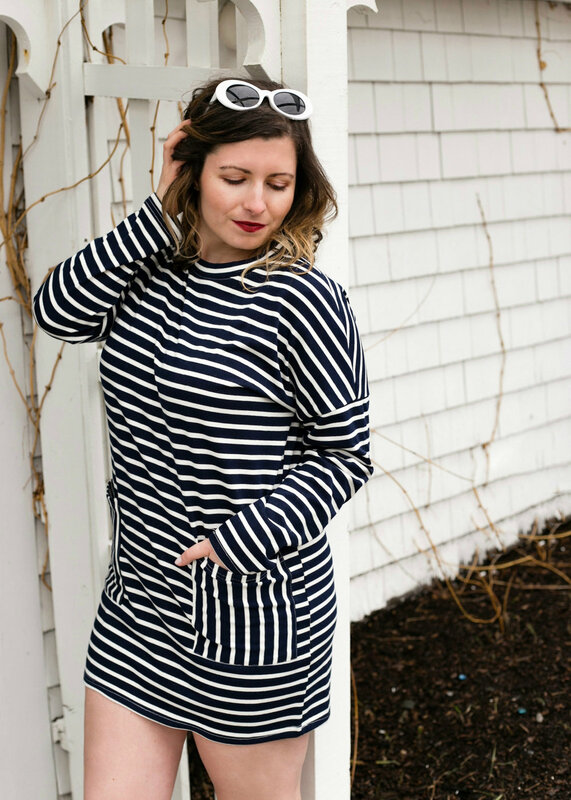 This striped dress is a must have for the spring season. 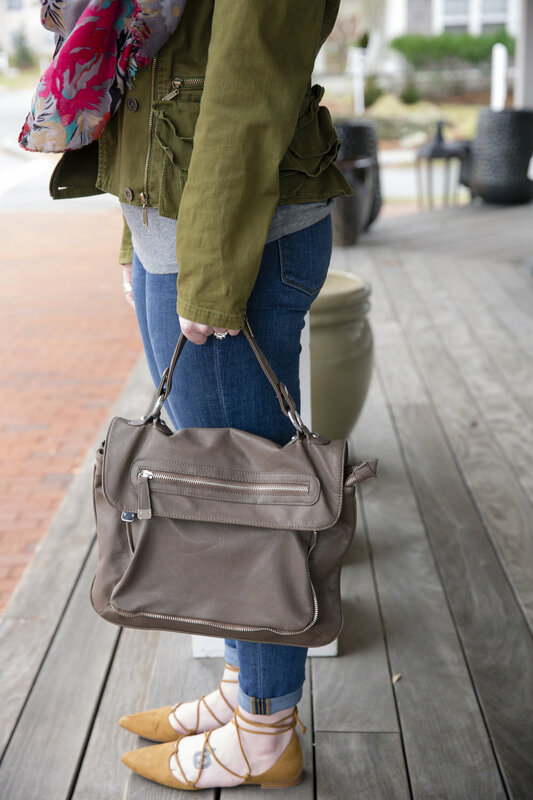 Not only is it a good transitional item but, it has pockets! I'm not sure about you but I'm a sucker for a dress with pockets. The sleeves on the dress make it a great transition item yet the length still makes it appropriate for spring. I paired it with my white chuck taylors & a pair of sunnies. If you want to cover up a bit I would suggest adding white leggings. I see this look going anywhere really: out to lunch, shopping, hanging out, adventuring, or even over a swimsuit. This dress can be yours for ONLY $59, get yours before its gone here ! This dress will easily become a staple in your wardrobe. Well fash dolls I hope that you have enjoyed this post & are starting to get spring fever. I know I am. Hello, beautiful! I hope you had a fabulous week. Between all the bachelorette parties, bridal showers, birthday shenanigans, & work being absolutely crazy the past 3 weeks I'm not going to lie I am starting to feel super run down. Sometimes we need to take a step back & take care of ourselves. Anyway, let's get to why we are here today: fashion. 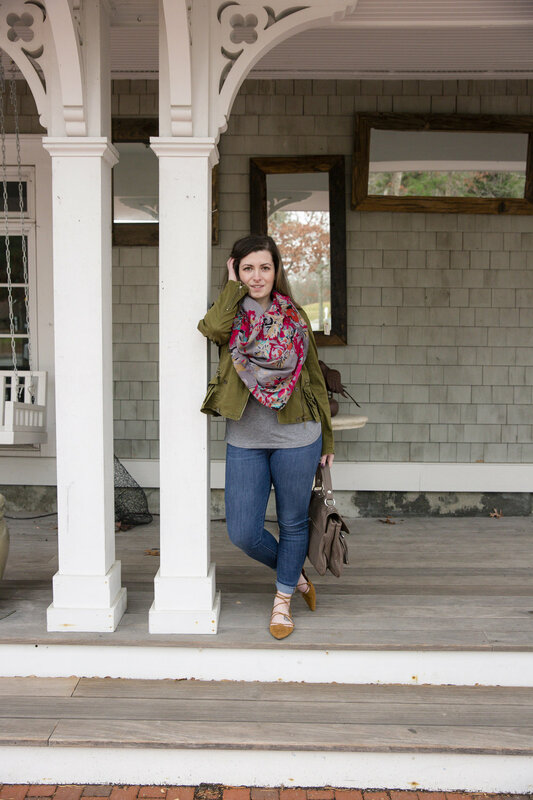 I know you are probably thinking spring layers? Why on earth would one want to layer in spring? Well the more obvious layering is a jean jacket over everything. I find this vital in my office because they crank the AC in the warmer months. Today I want to show you another way I layer. 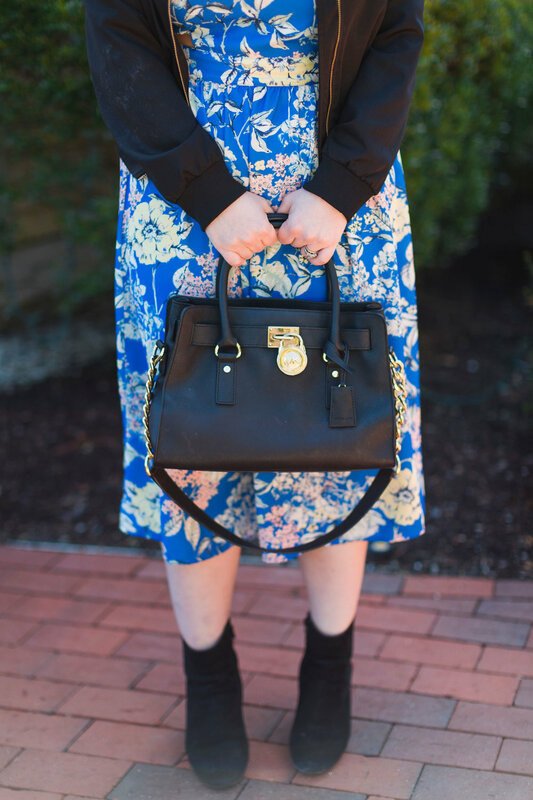 I love to layer tunics over dresses to create another look. Note the first two pictures in this post. At the base of this look is an a-line little black dress, I simply thru on my favorite tunic over the dress to develop a unique look. The green tunic in the winter I like to layer with leggings, a long sleeve shirt, & boots. Here I can take the same tunic year round by pairing over the black dress & platform heels. Take a look at your wardrobe, is there anything you can unexpectedly layer like this? When shopping I'm always thinking of versatile ways to wear things. I like to spend money on items that I will wear time & time again, I have a feeling I am not alone. Well fash dolls I hope you enjoyed this little tip & I hope it inspired you to try something new. Till next time. This look is perfect for transitional dressing. The maxi skirt & crop top are both spring items. I layered these two pieces with my denim jacket, hat, & scarf. You can barely tell I am wearing a crop top because this skirt is high waisted & my scarf is covering any skin shown. These booties are fabulous for 3 seasons (not including summer), they are perforated giving your toes some breathing room. 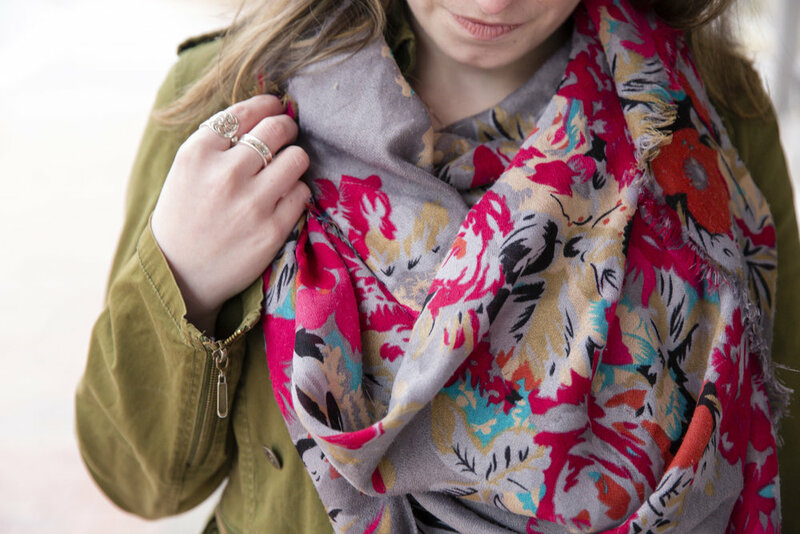 This ensemble has spring elements without compromising your warmth. I have worn this look on the weekend to lunch & shopping with friends. 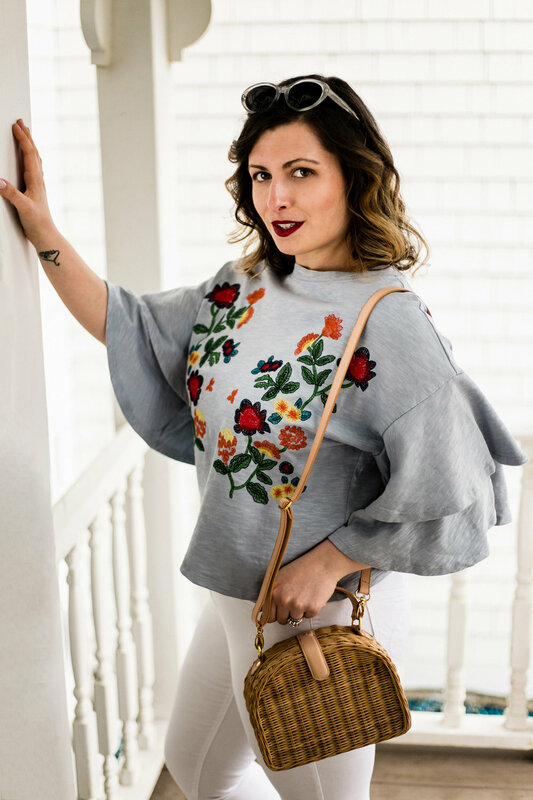 Try pairing a couple of your spring items with some of your fall pieces, this will be the perfect recipe for transitioning to spring in style. Well fash dolls that is all I have for you today. I hope you gleaned some helpful advice for transitional style. I am excited to tell you that my intern is starting tomorrow. I can't wait to introduce you to her. Till next time.